Cable and Wireless traded at 97 cents up 18 percent from Friday’s close of 82 cents with 29.092 shares trading leading to a 1 hour halt in trading. On resumption of trading the stock had the bid up to $1.02. 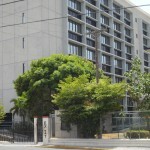 The stock is on offer at $1.20 to sell 20,000 units. Subsequent to 10.45am, Cable & Wireless traded at $1.02. The Jamaica stock market after 75 minutes of trading, recorded another morning of increases in the indices. Trading resulted in 15 securities changing hands with a volume of 1,243,459 units as 8 stocks gained and 3 declined. The All Jamaican Composite index jumped 880.02 points to 138,390.30 JSE Market Index rose 787.45 points to 124,766.87 the JSE combined index rose 839.35 points to be at 129,598.03 and the junior market index rose 10.74 points to 1,321.39. Jamaican Teas traded 118,989 shares at $3.45, Lasco Distributors had 608,300 shares changing hands at $3, Lasco Manufacturing 183,474 shares between $3.25 and $3.50. 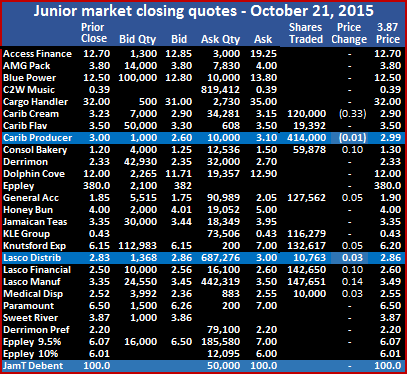 The junior market closed over the 1,300 mark for the first time on Friday, gaining 91 percent so far for 2015 and is heading even higher as several junior market stocks are undervalued. Trading resulted in 14 securities traded as the market index rose by 17.52 points to 1,310.65 for a new closing high. A total of 1,446,535 units, valued at $6,684,912 changed hands as 10 stocks advanced and 1 declined. The market ended with 4 stocks closing at 52 weeks’ high. 4 securities ended with no bids to buy, while 7 had no stocks being offered for sale. A total of 8 stocks closed with bids higher than the last traded prices and none closed with a lower offer. 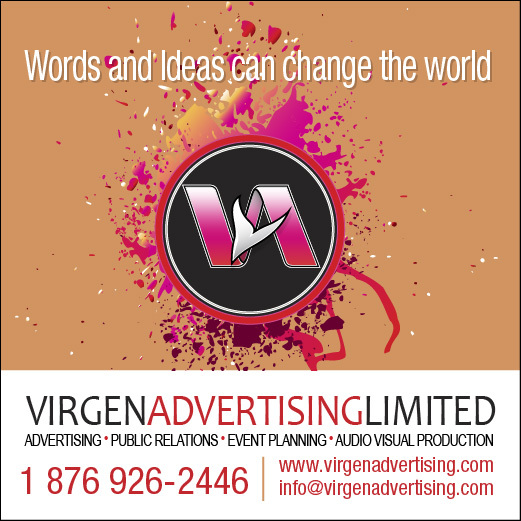 In trading, AMG Packaging closed with a gain of 57 cents at a 52 weeks’ high of $4.37 with 13,830 units changing hands, Caribbean Cream rebounded with a 20 cents gain and closed at $3.30 with 97,766 shares changing hands. Caribbean Flavours rose 18 cents to $3.98 with 270,000 shares changing hands to close at a new 52 weeks’ high. Caribbean Producers traded 31,000 units with a loss of 49 cents end at $2.50, Derrimon Trading had 32,804 units changing hands to end at $2.40 having gained 10 cents, Dolphin Cove rose 10 cents in trading 220,000 shares, to end at $13. General Accident ended with 80,000 shares changing hands, gained 30 cents and ended at a 52 weeks’ high of $2.20, Jamaican Teas had 30,000 units changing hands for 9 cents higher to end at $3.44. 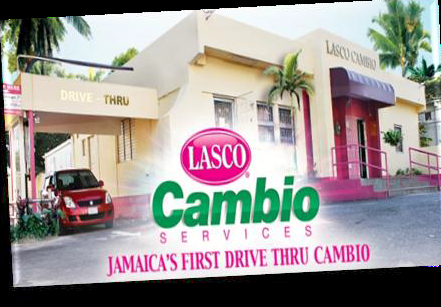 Lasco Distributors with 22,240 shares changing hands, closed 8 cents higher at $2.95, Lasco Financial gained 4 cents and closed at $2.45 while 427,767 shares changed hands. Lasco Manufacturing traded 192,350 shares to end at $3.30, Medical Disposables closed at $2.55 with 883 shares trading, Paramount Trading ended with 15,000 shares changing hands with a rise of 50 cents to end at $7 for a 52 weeks’ high and Eppley 9.5% preference share, closed at $6 with 12,095 units trading. Caribbean Flavours traded at a 52 weeks’ high of $3.80. The junior market ended with mixed results as 9 securities traded, the junior market index rose marginally by 11.18 points to 1,293.13 for a new closing high. A total of 1,295,041 units, valued at $4,032,383 changed hands as 5 stocks advanced and 3 declined. The market closed with 5 securities ending with no bids to buy, while 4 had no stocks being offered for sale. 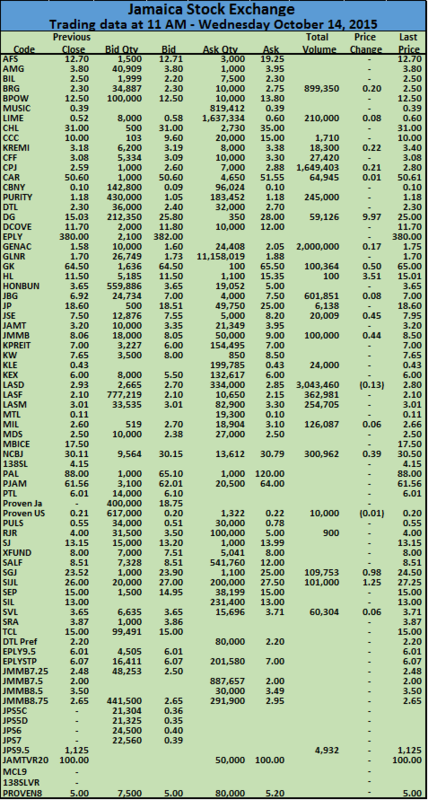 A total of 7 stocks closed with bids higher than the last traded prices and 1 closed with a lower offer. In trading, Caribbean Cream rebounded with a 20 cents gain and closed at $3.10 with 69,419 shares changing hands. 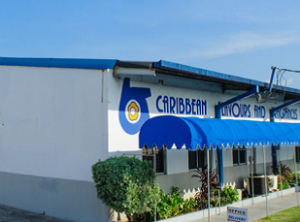 Caribbean Flavours rose 30 cents to $3.80 with 400,000 shares changing hands to close at a new 52 weeks’ high, Derrimon Trading had 54,665 units changing hands to end at $2.30 having lost 3 cents, Dolphin Cove rose 90 cents in trading 19,357 shares, to end at $12.90. Honey Bun ended with 5,000 shares changing hands to gain 8 cents and end at $4.08, KLE Group had 50,000 units changing hands at 43 cents, Lasco Distributors with 28,800 shares changing hands, closed 1 cent higher at $2.87 but traded as high as $3. Lasco Financial lost 19 cents and closed at $2.41 while 439,750 shares changed hands, the stock traded at $2.60 during the day, Lasco Manufacturing traded 228,050 shares to end at $3.30 after trading 19 cents lower. 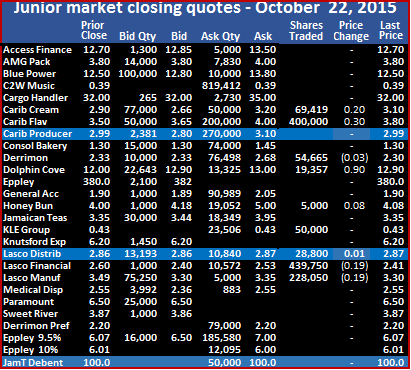 The junior market ended with 11 securities traded as the junior market index fell 3.83 points to 1,281.95 with 1,300,792 units, valued at $14,184,687, changing hands as 7 stocks advanced and 2 declined. The market ended with 5 securities ended with no bids to buy, while 2 had no stocks being offered for sale. 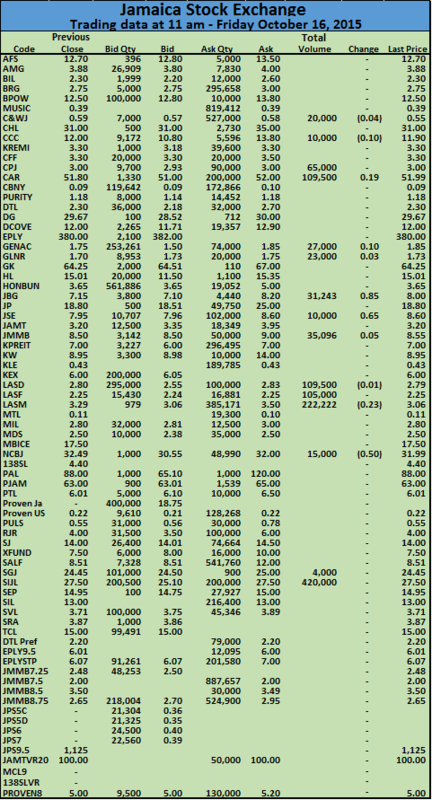 A total of 7 stocks closed with bids higher than the last traded prices and 1 closed with a lower offer. In trading, Caribbean Cream price slipped 33 cents and closed at $2.90 with 120,000 shares changing hands. Caribbean Flavours traded at $3.50 with 19,392 shares changing hands, Caribbean Producers traded 414,000 units to end at $2.99, Consolidated Bakeries rose 10 cents in traded 59,878 shares, to end at $1.30. General Accident Insurance ended with 127,562 shares changing hands to gain 5 cents and end at $1.90, KLE Group had 116,279 units changing hands at 43 cents, Knutsford Express traded 132,617 shares at $6.20 after adding 5 cents to end at a new 52 weeks’ high, Lasco Distributors with 10,763 shares changing hands, closing 3 cents higher at $2.86. Lasco Financial closed at a new all-time closing high of $2.60 while 147,651 shares changed hands with the price rising 10 cents, the stock traded at $2.65 during the day, Lasco Manufacturing traded 147,651 shares to end at $3.49 after trading 14 cents higher and Medical Disposables closed at $2.55 with a rise of 20 cents with 10,000 shares traded. Caribbean Flavours traded at a 52 weeks’ high of $3.50. The junior market ended at a new record high at the close, with 13 securities traded and the junior market index rising by 23.09 points to 1,285.78 with 1,356,689 units, valued at $3,717,777 changing hands while 7 stocks advanced and 3 declined. The market ended with 5 securities closing with no bids to buy, while 4 had no stocks being offered for sale. A total of 8 stocks closed with bids higher than the last traded prices and 1 closed with a lower offer. In trading, AMG Packaging closed with a loss of 8 cents with 26,909 units changing hands at $3.80 at the end of trading, Cargo Handlers ended with 712 shares changing hands, for a gain of $1 and closed at a new all-time high of $32, Caribbean Cream price slipped 7 cents and closed at $3.23 with 75,719 shares changing hands. Caribbean Flavours traded at a new 52 weeks’ high of $3.50 with 23,708 shares as the price rose 20 cents, Caribbean Producers traded 7,100 units to end at $3, Consolidated Bakeries rose 2 cents in traded 173,007 shares, to end at $1.20. Derrimon Trading ended with 335 shares changing hands to gain 3 cents and end at $2.33, Honey Bun had 10,222 units changing hands at $4, for an increase of 35 cents. Jamaican Teas had just 7,175 shares changing hands at $3.35, Knutsford Express traded 5,000 shares at $6.15 after adding 15 cents for a new all-time high, Lasco Distributors with 66,215 shares changing hands, closed at $2.83. Lasco Financial closed at a new all-time high of $2.50 while 549,875 shares changed hands with the price rising 24 cents and Lasco Manufacturing traded 410,712 shares to end at $3.35 after trading shedding 10 cents. Lasco Financial traded at a new 52 days high high of $2.26. 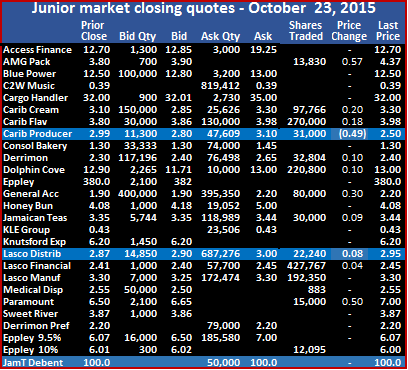 The junior market closed with 9 securities traded and the junior market index was up 30.52 points to 1,262.69 with 1,086,466 units, valued at $3,165,918 changing hands as 7 stocks advanced and none declined. The market ended with 5 securities ended with no bids to buy, while 5 had no stocks being offered for sale. A total of 6 stocks closed with bids higher than the last traded prices and 2 closed with lower offers. 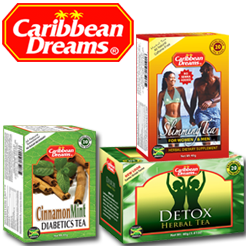 In trading, Caribbean Cream closed at $3.30 with 17,895 shares changing hands, Caribbean Producers traded 174,822 units to end at $3. General Accident had 27,000 units changing hands at $1.85 for an increase of 10 cents, Jamaican Teas had just 1,515 shares changing hands at $3.35, Lasco Distributors rose 3 cents with 264,325 shares changing hands and closed at $2.83. Lasco Financial closed at a new all-time high of $2.26 while 175,263 shares changed hands, Lasco Manufacturing traded 370,646 shares to end at $3.45 after trading gaining 16 cents, Medical Disposables traded 45,000 at $2.52 for a 2 cents gain and Paramount Trading had 10,000 shares trading at $6.50 for a gain of 49 cents as the company recently reported increased profit for the August quarter. The Jamaica stock market for the second consecutive morning, is enjoying slow trading with only 15 securities being active at 10.45 ,but the indices have so far climbed quite a bit with all main market indices up by more than 1,000 points. 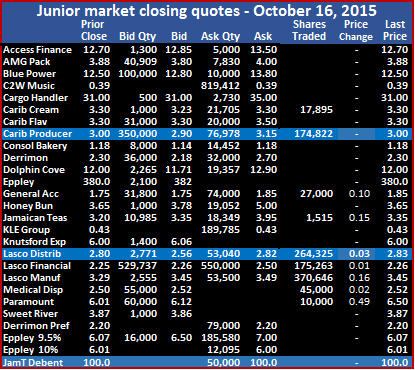 Jamaica Broilers trades at new 52 weeks’ high of $8. Trading accounted for a volume of 1,206,561 units with 6 stocks gaining and 5 declined. In trading, Carreras exchanged 109,500 shares at $51.99 to gain 19 cents, Jamaica Stock Exchange had 10,000 shares trading at $8.60 for a rise of 65 cents as the company stands to see increased income if trading continues to be bullish. JMMB Group exchanged 35,096 shares at $8.55 for a small gain, Scotia Investments had 420,000 units changing hands at $27.50, Caribbean Producers traded at $3 with 65,000 shares. Lasco Distributors 109500 shares traded at $2.79, Lasco Financial Services 105,000 shares traded at $2.25, Lasco Manufacturing 198,172 shares traded at $3.50. The All Jamaican Composite index jumped 1,124.16 points to 132,131.96 JSE Market Index rose 1,005.91 points to 123,570.27, the JSE combined index rose 1,281.46 points to be at 123,840.64 and the junior market index rose 37.15 points to 1,269.32. Caribbean Flavours traded at a 52 weeks’ high of $3.30. 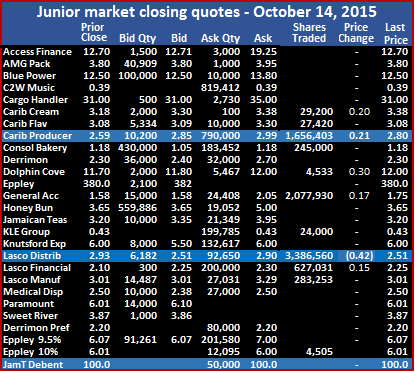 Focus on the Jamaica Stock Exchange on Thursday was mostly on main market stocks with only 7 junior market securities trading up to midday. By the close, 10 securities traded and the junior market index was up 27.38 points to 1,232.17 with 2,227,302 units, valued at $6,746,786 changing hands as 5 stocks advanced and 1 declined. The market ended with 5 securities ended with no bids to buy, while 3 had no stocks being offered for sale. 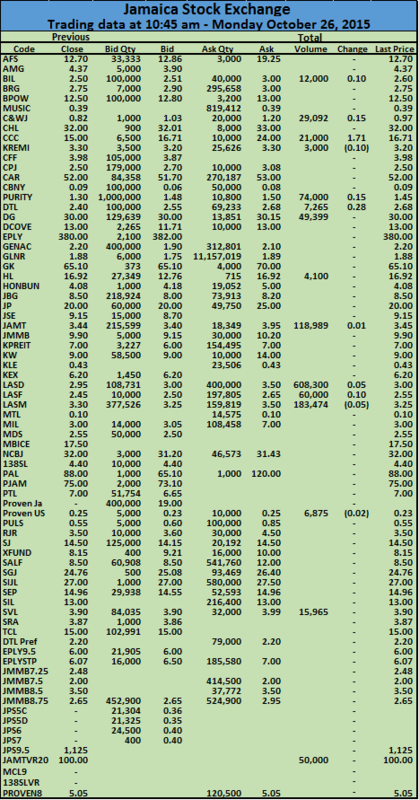 A total of 7 stocks closed with bids higher than the last traded prices and 2 closed with lower offers. 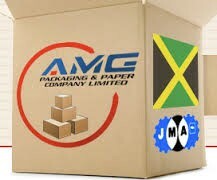 In trading, AMG Packaging gained 8 cents to close at $3.88, with 1,072,687 units changing hands, Caribbean Cream fell 8 cents to $3.30 with 2,000 shares changing hands, Caribbean Flavours added 22 cents in trading 10,000 units at an all-time high of $3.30, Caribbean Producers traded 51,678 units and gained of 20 cents to end at $3. Consolidated Bakeries had 169,000 units changing hands at $1.18, Derrimon Trading had 635,700 shares changing hands at $2.30, KLE Group traded 10,000 units at 43 cents. 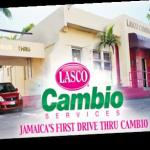 Lasco Distributors rose 29 cents with 20,000 shares changing hands and closed at $2.80, Lasco Financial closed at $2.25 while 156,219 shares changed hands and Lasco Manufacturing traded 100018 shares to end at $3.29 after trading gaining 28 cents. 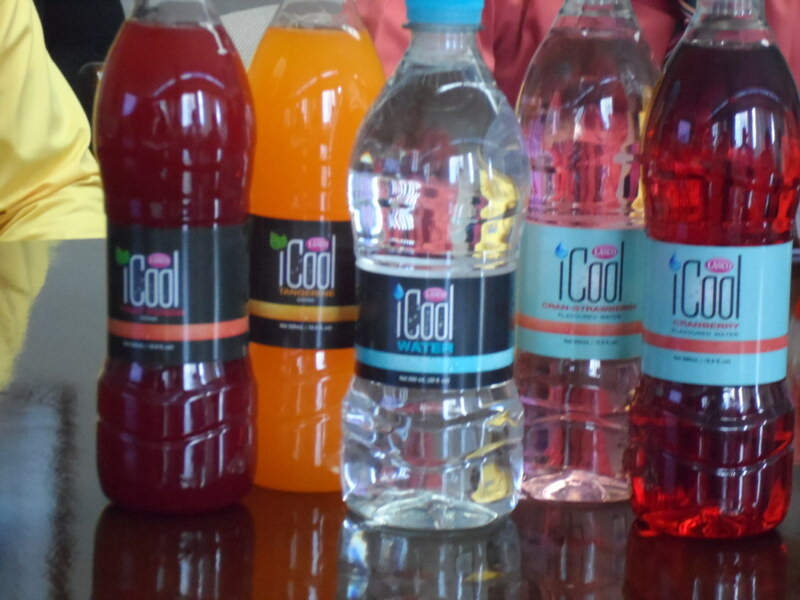 Lasco Distributors with responsibility to distribute “I Cool” drink, pulled juniors down. 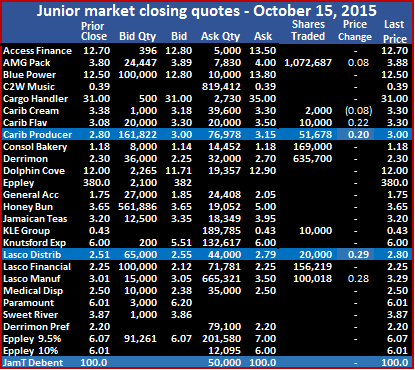 The junior market index hit 1,300 points in the morning session on Tuesday fell sharply on Wednesday by 53.54 points to 1,204.79 with Lasco Distributors falling 42 cents, to close at $2.51 with 3,386,560 trading, while 5 stocks advanced, 1 declined as 11 securities encompassing 8,365,835 units, valued at $20,414,001 changing hands. The market ended with 5 securities with no bids to buy, while 3 had no stocks being offered for sale. A total of 7 stocks closed with bids higher than the last traded prices and one closed with a lower offer. In trading, Caribbean Cream had 29,200 shares changing hands at $3.38, to regain 20 cents it lost on Tuesday, Caribbean Producers traded 1,649,403 units with a gain of 21 cents to end at $2.80, Consolidated Bakeries had 245,000 units changing hands at $1.18, Dolphin Cove traded 4,533 units for a gain of 30 cents to end at $12. General Accident traded 2,077,930 units at $1.75, as the price gained 17 cents, KLE Group traded 24,000 units at 43 Cents, but traded at a 52 intraday low of 42 cents, Lasco Financial closed at a new all-time high of $2.25 with a gain of 15 cents while 627,031 shares changed hands. Lasco Manufacturing traded 283,253 shares to end at $3.01 after trading down to $2.76 and up to $3.21 and Eppley 9.5% preference share had 4,505 units changing hands at $6.01. The main market of the Jamaica Stock Exchange recorded its highest gain ever with a huge jump of 9,440.63 points on All Jamaican Composite index to hit 126,995.43 as Desnoes & Geddes traded 59,126 shares at $25 for an increase of $9.97 to be the main contributor to the gains. Trading in the overall market has been strong with 28 securities being active at 11 am, with a volume of 10,402,800 units as 17 stocks gained and 2 declined. In Trading, Berger Paints traded 899,350 shares at $2.50, Caribbean Producers exchanged 1,649,403 up to $2.80, General Accident traded 2,000,000 units at $1.75, Jamaica Broilers exchange 601,851 shares at $7 and Lasco Distributors had 3,043,460 units trading at $2.80. The JSE Market Index rose 8,447.57 points to 114,570.64, the JSE combined index rose 7,451.90 points to be at 118,884.23 and the junior market index fell 58.68 points to 1,199.65.